1. Headbox: Hydraulic headbox, through regulate and control input pulp main pipe inflow pressure and top & bottom lip’s opening degree of headbox to control and stabilize of the sieve slurry sizing head and the concentration. 2. Wire part: single fourdrinier, main parts: breast roll, forming plate, dehydration plate, vacuum box, couch roll, driven roller, guide wire roll and frame and so on, which equipped with 1 piece of forming wire. 3. Press part: divided into main press and carrier roller press. Main press is double roll press, and equip with each one high and low covered rubber metal roll; idler press is consist of carrier roll and 1 # large cylinder, and with one piece of covered rubber metal roll. Main press equip with guide felt roll and felt suction box, and with top & bottom felt. 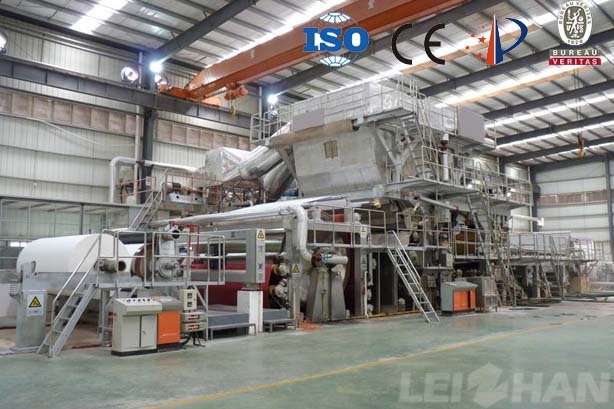 The carrier roll of idler roll press share one piece of top felt with main press. The main press and the idler roll press’s pressure method is corrugated tire pressure. ①: large cylinder:Φ3000/Φ3600 dryer cylinder, single transmission and equip with closed type hot air hood, 2 pieces of wrinkle doctor blade, 1 piece of clean doctor blade. Pressured way is air cylinder pressure. ②: large cylinder:Φ3000/Φ3600 dryer cylinder, single transmission, equip with dry wire and guide wire roll, no hood, and with 1 piece of clean doctor blade.Pressured way is gravity pressure. 5. Reeling part: Pneumatic horizontal type winding machine, air cylinder pressure.